They have worked on five of the ten biggest box-office hits in history. They have made possible iconic images which will stay permanently in the retina of those who grew up with them: from the attack of rebel spaceships on the Death Star, to the most realistic dinosaurs ever seen on screen. Not forgetting the impossible sequence where Tom Hanks shook hands with president Kennedy, or the unforgetable silhouette of ET the Extra-Terrestrial and his friend Elliot standing out against the Moon. Industrial Light & Magic, ILM, is much more than the biggest special effects company in the world. Their legacy has completely changed the way films are shot, the visual vocabulary at the disposal of filmmakers, and even the ontological status of the image in contemporary culture. It's difficult to overstate the influence ILM has exerted on the industry and art of cinema in the last three decades. 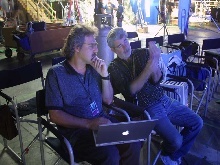 The scientists, artists and multidisciplinary creatives called together by George Lucas in the north of California in the middle of the 70s to make the dream of his galactic saga possible provided filmmakers such as Spielberg, Zemeckis or Lucas himself with the visual devices they needed to reinvent Hollywood. The result is the model of global-scope blockbuster which has controlled worldwide box offices up to the present day. But ILM has also been one of the most important research and development laboratories of image technology. The possibilities opened up by these techniques and tools have changed the way films are made at least in the same way that word processors have changed the way novels are written; even having an influence on directors who are diametrically opposed to visual effects films. (Among these directors who have asked ILM for help more than once in the last years we can find, for example, Woody Allen). Finally, since 1982 when they used it for the first time in the second chapter of "Star Trek", Lucas' company may have been the main driving force of computer animation as a creative discipline. Image synthesis has become a huge industry these days fixing tens of thousands of artists worldwide with a job and being present in every field of audiovisual production. 2005 has been a special year within ILM. The Saga of Star Wars, the series of films which caused the creation of the company thirty years ago, was completed in order to show at last the central fact in the galactic mythology: Anakin Skywalker's fall to the dark side and his transformation into Darth Vader. As expected, Lucas' best men have devoted themselves to the most complex project ever dealt with in an unprecedented visual show. 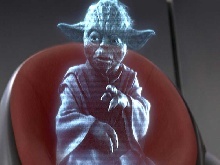 Episode III means the crowning achievement of all techniques developped for the two previous parts: countless digital sets of great diversity, more and more virtual actors, and a huge number of different elements absolutely everywhere in every shot. "Revenge of the Sith" has not been the only ambitious project produced by ILM this year. If Lucas' films are, for obvious reasons, those which demand more efforts from the company, those films produced by the other flagship director, Steven Spielberg, follow them closely. The new version of the classical "War of the Worlds" by H.G Wells required a different treatment to the usual big productions of special effects, more subtle and realistic, concealing in the shade those terrors that the story hides. The task requires twelve weeks of work at a relentless pace for hundreds of animators headed by two of the most famous visual effects supervisors in the company, the legendary Dennis Muren and the Argentinian Pablo Helman. About to enter their fourth decade of life, ILM promises to keep offering unprecedented and spectacular visual shows. From their bright new installations in San Francisco, where they have recently moved after a whole life hidden in unidentified big industrial premises, the company is already working on twelve new productions which will be premiered throughout next year. Founded in 1975 by George Lucas to create the wonderful universe of the "Star Wars" trilogy, Industrial Light & Magic is without a doubt the most important visual effects company in the world. Fourteen Oscar awards, more than two hundred films behind them, and their crucial contributions to disciplines such as digital image synthesis have turned ILM into one of the most important stars in the film world of the last three decades. Pablo Helman from Argentina is one of the present visual effects supervisors in ILM, (the highest post on the scale within special effects industry). He has worked in the second "Star Wars" trilogy and in productions such as "Apollo XIII", "Saving Private Ryan", "Contact" or "Jurassic Park II: The Lost World". 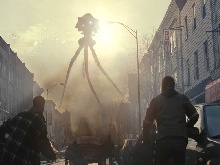 As a visual effects supervisor, he has been one of the main heads in the recent "War of the Worlds".